Neuschwanstein Castle is one of the most popular tourist attractions in Germany. The beautiful palace was built on the 92 meter hill in the Bavarian Alps. Its covers the southwest part of this German province, near Hohenschwangau which is close to the Austrian border. While photographing the interiors of the castle Neuschwanstein is not allowed, the facade is one of the most common shooting buildings in Germany. The imposing figure of this beautiful palace was chosen to become a major part of the logo of Walt Disney. 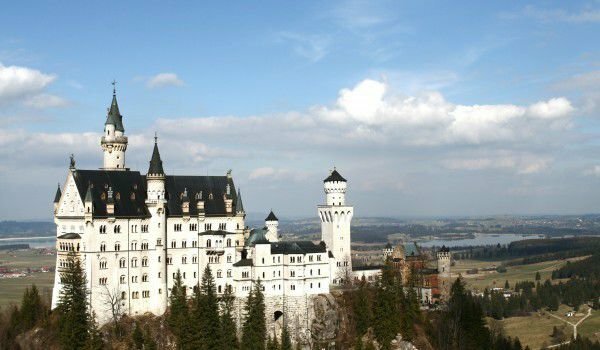 In translation Neuschwanstein means, New swan stone, and its name is inspired by the knight of the swan of Wagner's opera, Loengrin. This is the most famous castle of Bavarian King Ludwig II, often he was referred to as the mad king. Situated in the foothills of the Bavarian Alps and the Zugspitze peak, the so called, Castle of the swan cliff is located at the foot of Mount Zugspitze, in the municipality of Schwangau, near the town of Füssen, which is on the border with the Austrian province of Tyrol. Ludwig II, also called, fool's fantasy, begins construction of Neuschwanstein castle in 1869, the place where he grew up. This major work of art was designed by architect Eduard Riedel, which completed the work on Neuschwanstein after 17 years of hard work, shortly before the death of the mad king in 1886. Because of its unique architecture and interior design Neuschwanstein is visited annually by more than a million tourists. Called the "fairy-tale castle" it was built in the authentic style of the old German knight fortresses. The Throne Hall of Neuschwanstein was designed and made in the Byzantine style, like the hall, which kept the Holy Grail. It consists of two floors and is inspired by the church St. Sofia in Istanbul. The secret occult signs and symbols can be seen throughout the palace, and many mythological scenes recreated in beautiful frescos.